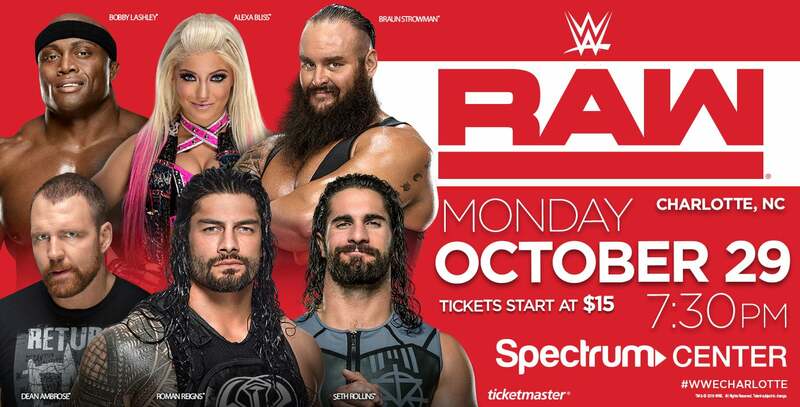 August 20, 2018– Hornets Sports & Entertainment announced today that WWE Monday Night Raw is coming back to Charlotte’s Spectrum Center for the first time in two years on Monday, October 29, at 7:30 p.m. Some of WWE’s top performers will be ready for action, including Universal Champion Roman Reigns, Intercontinental Champion Seth Rollins, Dean Ambrose, Dolph Ziggler, Drew McIntyre, Braun Strowman, Sasha Banks and more! Tickets go on sale to the general public on Friday, August 24, at 10 a.m. via spectrumcentercharlotte.comorticketmaster.com, the Spectrum Center box office or by phone at 800-745-3000.